Why is it so hard to serve God these days? Church workers suffer from low morale, while Christians of all stripes struggle to find their way in a culture fixated on sexuality, violence, and wealth. In Keeping the Sabbath Wholly (1989) Marva Dawn introduced the vital Sabbath aspects of resting, ceasing, feasting, and embracing. Now, in The Sense of the Call, she expands these into a way of life for serving God and the Kingdom every single day of the week. A Sabbath way of life, Dawn asserts, consists of resting in the Kingdom's grace, ceasing by grace those attitudes and actions that hinder the Kingdom, feasting so as to radiate the grace-full splendor of the Kingdom, and embracing the Kingdom's gracious purposes. To this end Dawn teaches skills such as learning to rest in prayer, saying no to busyness, enjoying one's body as God's temple, and embracing the cost of living as a Christian disciple. Both frank and compassionate, The Sense of the Call will guide Christian servants into a more restful, joy-full life of trust in God. Start reading The Sense of the Call on your Kindle in under a minute. In her newest book, Dawn, a theologian and educator with Christians Equipped for Ministry in Vancouver, Wash., applies the concepts of her earlier book, Keeping the Sabbath Wholly, to the ministry of clergy and church leaders. While using the same Sabbath practices as in her first book (resting, ceasing, feasting and embracing the Kingdom), Dawn focuses more on God's call to ministry that reclaims, revitalizes and renews, "and thus reigns through us before others, on behalf of others, sometimes in spite of others, and always with others." The book's mission—to spiritually rejuvenate those who are often burned out from unending service—is essential and long overdue. But despite the promising concept, the blend of the themes of the first book with these new themes is sometimes unfocused and rambling. Dawn quotes other scholars, sometimes at great length, on almost every page, so there's little that's new. Dawn's repeated insistence that she's "such a beginner" with these ideas and practices, her frequent references to her own health problems, added to her overreliance on other scholars' work, leaves the impression that this particular book may not be the best guide to exploring a Sabbath way of living. (Mar. )Look for more reviews, exclusively on the Web, at www.publishersweekly.com, Review Annex. "Last summer when I heard Marva Dawn preach in Toronto, I saw a frail human being ― physically. But there was nothing frail about her reading of Scripture and her preaching. The biblical text leapt off the page and inspired a kind of gospel-fuelled courage to be the church. . . Dawn has a profound sense of call, not only for herself but also for the church which, in so many ways, has a frailty not always acknowledged." "The Sense of the Call is packed with Bible studies, illustrations from church history, and personal anecdotes, all geared to convince readers of their need to be regularly reclaimed, revitalized, and renewed." "Inch by inch, row by row . . . Marva Dawn patiently (but not complacently!) works in the garden of God, this planting of sinner-saints in which we live and grow. She waters and weeds, cultivating holy and wise lives. She works at the center, where Jesus is at work with us. There is not a trivial or superfluous word in this book. Dawn is insistent and winsome ― an American prophet." "What a holy oddity Marva Dawn is. She juggles the prophetic with the pragmatic, stern warning with giddy invitation, a scholar's exactitude with a child's whimsy. She embodies both human brokenness and divine transformation, writing about both with level calm and quiet authority. Mostly she sees ― clear-eyed and unflinching ― the sheer madness of our mere busyness, and she calls us back to the ancient rhythm of Sabbath keeping and, through that, the discovery that the kingdom is among us and has been for a long time." "The Sense of the Call issues both a timely challenge and a ceaseless invitation. . . With conviction and concreteness, Marva Dawn leads us to embrace the gifts of God, the catholic disciplines and teachings of the Church, and the mission of our passionate God, who calls us to participate in the Kingdom and the priesthood. Even where the reader may disagree with her particular diagnosis of ills in Church or society, Dawn consistently and graciously points us toward the One who is the source and fulfillment of all authentic life in the Spirit. Above all, she recalls the Joy that is showered upon those who, in service and restful celebration, find their sustenance in the triune God." As a person in ministry though not a pastor, I found this book extremely helpful in addressing the way many of us in ministry "work" for God but forget to "be" with God. The call to observe Sabbath well is part of our call to ministry and Dr. Dawn has some excellent thoughts here. I loved her sections on restful living and prayer - learning to rest in grace. She considers the blocks to prayer (the three temptations of Christ + pride), and offers devotional practices that stretch our skills. The Messiah complex is one of the greatest hinderances to healthy spirituality and healthy ministry and Dawn addresses this issue with compassion, hope and encouragement while challenging us to remember that we have human limits and were made to live as members of community not leaders who live slightly removed from it. When we embrace our humanity instead of trying to live beyond its limits, we open the door to fruitful life and sustainable ministry. I strongly recommend this book as a helpful tool for ministers to find ways to honor the Sabbath and embrace it as God's gift and commandment. You will find undercurrents of social justice and great encouragement to equip the saints to do the work of the Church, enabling ministers and leaders to be part of the ministering community, to live whole, healthy lives. Someone once said you can't take people where you haven't gone. This book will help you live the gift of Sabbath and invite others join the journey toward a deeper life in Christ and to live wisely and well in a self-absorbed and hurting world. 5.0 out of 5 starsA well thought through, and refreshing book. There is not enough good literature relating to a Christian practice of Sabbath. I was excited to discover Dawn's latest book on Sabbath. It was a blessing from beginning to end. 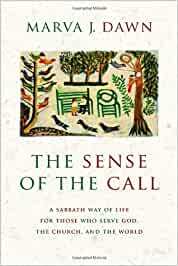 The Sense of the Call is a comprehensive survey of the best literature pertaining to Sabbath accompanied by Dawn's delightful and inspired insights into the subject. Ministers and laypersons alike should read this book. This book is real and relevant for those who feel as though they are climbing up the rough side of the mountain. Marva is in tone and touch with the challenges that faces ministers who bleed and they lead within the body of Christ. Marva Dawn has a way of making everything she does serve God. She has a keen sense of service and rejoicing that every book she writes conveys, so we can find that same joy in life.